Have you sold your artwork before? What about trying to create your own photo or design gifts? I'm sharing some steps for creating one art-for-sale option. I decided I wanted to try to sell some of my photos on greeting cards. I've been wanting to do this for awhile now, and finally took some action on the plan. Step 1: I chose some of my favorite recent photos to use for the first round of tester photo cards. I'm using a few of these Denver field sunflower shots I got a few weekends ago and using a few vegetable images I took this summer at a Brooklyn Farmers Market I went to. I love snapping images of food, especially at farmers markets. 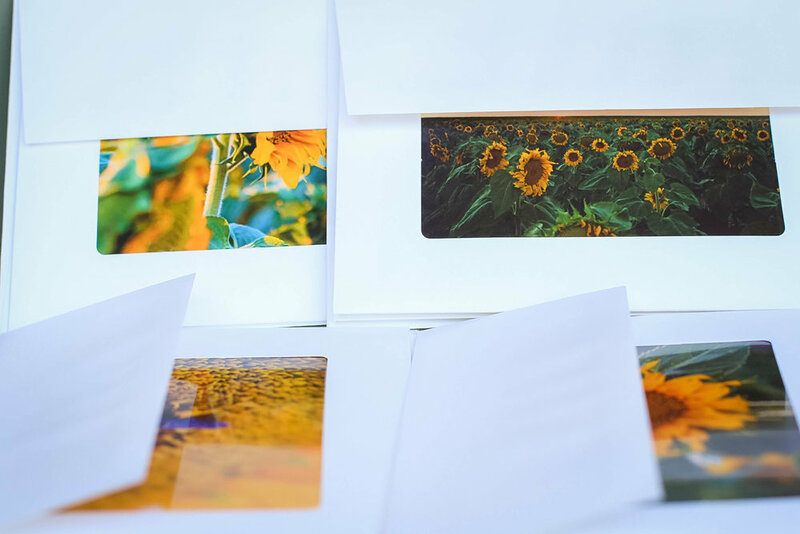 I printed the sunflower pictures out at a local photo shop choosing the 4x6" size to fit into the frame of the 5x7" cards. I went with a square 2.5x2.5" size for the farmers market prints to adhere to the 3x3" blank minis. 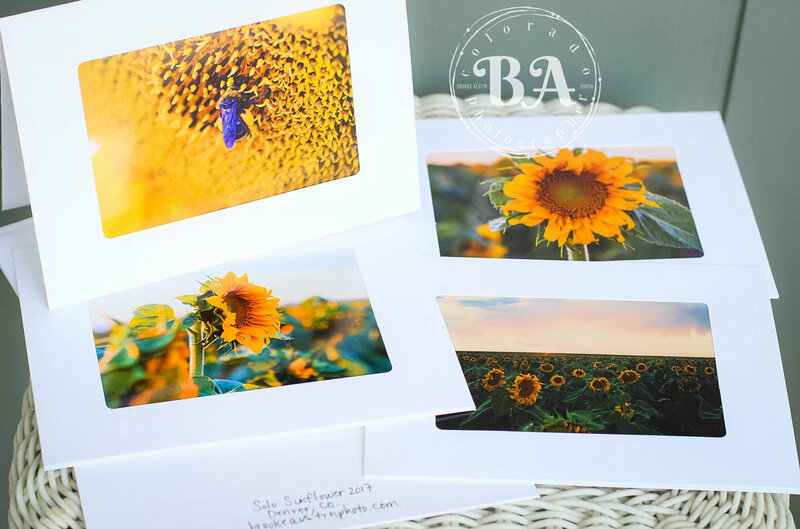 Step 2: To "make the creativity happen", I picked up these great plain white frame cards at Michael's craft store that will work out perfectly to set my sunflowers images in. I've been wanting to play with some small prints for a project and when I stumbled upon these cute mini square cards it was like an "aha" moment! Snagged them to use with the farmers market pics. Step 3: I put on my favorite guilty pleasure trash T.V. show Real Housewives of Orange County, because the first step of garbage television viewing recovery is admitting that I am powerless over my obsession with Tamra on the RHOOC. It's my modern day soap. Don't "Tamra Judge" me. LOL! You know you have some shows that you watch in hiding. I printed my own mini squares out to try for the smaller cards, but I'm not sure if I'm loving the quality of my home printer so much. Will have to explore this a bit further in the future. Anyway, I cut out the square images individually and attached to the mini 3x3" cards and I slid the 4x6" sized prints into the frame slots on the larger greeting cards. And I did this all while Tamra and friends gave me some much needed background noise company goodness. Step 4: Now I have my first photo greeting cards that I added simple handwritten titles and my website to the back and left blank to allow customers to add their own messages to. I think I might sell the small ones as a set of three and the bigger ones individually, haven't decided yet. I will be placing these in my little booth space at the art & furniture store I work for called The Blue Chair, a nifty local Colorado art market that sells repurposed home furnishings and showcases over 150 local vendors and artists. If you're in the Denver area, stop by and see it sometime, it's a treat! What about you? Do you have some artwork that you could showcase at a local shop? What other ideas can you think of to market your affordable art? Why not give it a try? It could be fun! I've been anxious to get out near a field of sunflowers all summer and finally found out where a few were located off the highway near the Denver airport. I think I was a little late in the season getting out there to shoot photos (note to self get out a bit earlier in August next time), but I'm still glad I headed out last weekend for an evening sunset near this lovely sunflower field. I didn't see any private property signs, and noticed a lot of other people and photographers walking around through the flowers quite a bit, but I am guessing this is technically a farmer's crop, so I tried to stay near the edge of the field and snapped most of these from the road or just a few steps in. I did my best to avoid stepping on any flowers and have respect for the field while also capturing the glory of the sunflower subject! Colorado has some magnificent sunsets and though the mountains are straight ahead in these shots, they got pretty washed out in my images. I think I still managed to get some good ones and here are some favorites from the shoot.